I render our urban landscape with a blend of caricature and idealism. I make buildings look like living things and my stylized distortion of architecture often represents the people who inhabit the buildings and neighbourhoods. The vivid colours and implied instability create a whimsical view of the city that seems as happy as most of us wish we were. I’ve learned that you can’t control the world but you can interpret it so I choose to emphasize the color and character and electricity of life. My hope is that those who like my work get a jolt of familiarity. I grew up in a pulp mill town in BC’s interior. My art teachers were often exasperated because I wanted to go by instinct, which means I am mostly self-taught. The stereotype of the starving artist combined with the 80’s recession scared me away from art and steered me towards Vancouver where I got a degree in English and studied practical things like Computer Science, Finance, and Marketing. I still painted but my poor roommates had to put up with a lot of somewhat gothic subject matter over the years. With every new painting I hung on the wall, they’d tactfully suggest that I should get some fresh air and sunshine. Painting was my way of working out frustration at a world I couldn’t control. I took a temporary corporate job to pay the bills for sixteen years. I painted sporadically and eventually rarely between various systems projects. Eventually, years of traveling in binding business suits and never seeing the sum of my efforts add up to anything more than my bank account made me feel like I was starving in a different way. I was becoming detached and cynical rather than passionate and optimistic and I no longer believed that what I was doing was relevant. So I started painting again and this time I focused on local subjects and things I knew. I decided to communicate a sense of joy and resilience in every image because there are times when we all need a reminder of that looks like. In 2008, I made painting my full-time career. I work out of The Beaumont Studios in beautiful Vancouver, British Columbia. l am maryam, from iran. Im painter and conceptual artist. I am so interested in your arts. I want som information about art in vancouver, what are the jobs for an artist in vancouver? 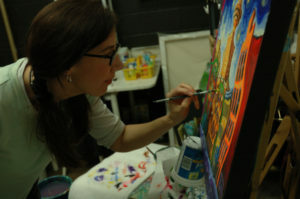 Hi Maryam, What are jobs for an artist in Vancouver? It seems our videogame industry is pretty hot but I’m not the one to ask about that. 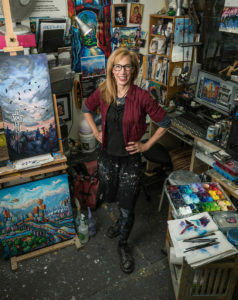 Are you asking whether there are opportunities for self-employed artists in Vancouver? Yes, there are, as in many other places. Are you asking whether the art market is “good” in Vancouver? For me it is because I’ve established a market selling local scenes. I’m not sure if that answers your question. Hi Carmella! Thanks so much for your comment. I was raised in Kamloops, BC and my age as of 2017 is not yet 50. My biggest inspirations and favorite artists are Vincent Van Gogh, Salvador Dali, and Edvard Munch.